There are several things we wouldn’t mind having more of in Hong Kong: good Spanish food, artisanal beers, home-cured bacon and Korean fried chicken. Thanks to Lee Family Chicken, we can happily tick the last item off our list. Modelled after the typical, no-frills Korean hof (a beer and soju bar similar to Japanese izakayas), Lee Family’s tinted glass door slides open into a dimly lit room that brings to mind seedy scenes from a Wong Kar-wai movie. Inside, the floor is sectioned off into spacious, semi-private booths, the largest of which houses a table wide enough to fit 16 boisterous businessmen and their beers. The décor is pared down to a handful of kitschy 1950s American plaques and a TV screen tuned into K-pop videos on rotation. 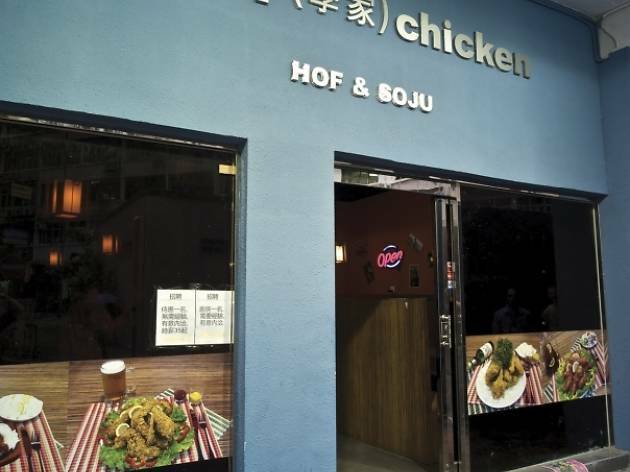 The horrendous furnishing is a moot point though, mostly because the (predominantly Korean) clientele come here solely for two things: booze and fowl. 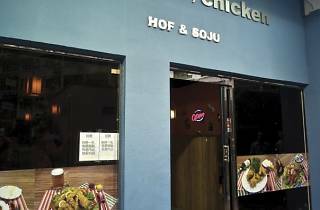 The menu’s entire first page is dedicated to fried chicken, all served by the whole bird with sides of pickled radish and thousand island-doused shredded cabbage. There are four different styles of chicken to choose from, the most popular of which comes with a thick breaded crust that’s generously glopped with sweet and sticky chilli sauce and sesame ($160). It’s messy, sloppy, eat-with-your-fingers fare spiked with a buzzing heat and a garlicky aftertaste. This is the big sell here but we’re actually more inclined towards the soy sauce chicken ($160) – a more profound bird that has its skin double-deep-fried to a crisp, paper-thin sheet. Steeped for hours, the marinade leaves traces of salty spice on the meat, which in turn stays moist and succulent from thigh to breast. 84 Kimberley Rd, Tsim Sha Tsui, 2375 8080. Daily 5pm-4am. Dinner for two: around $400.